Last time we talked about the ‘magic number’ of projects or other activities you can devote your time and energy to without things beginning to fray at the edges, which turned out to be two and a half. But many of you probably know people that seem to manage a lot more than that, those seemingly inexhaustible people who juggle time like Doctor Who and seem to squeeze several extra hours out of a normal day. And I promised that this time I’d reveal how they do it, or at least how they create the impression that they are. You’ve probably heard this so often, but that doesn’t make it any less true; productive people plan ahead. Not necessarily in fine detail or obsessively, but they think ahead and write down what they have to do. The most common forms I’ve seen are well know to us all, even if we don’t use them: a diary and a to-do list. The most productive people I know write their to-do lists at the end of the working day ready for tomorrow – that way they can just get into action first thing without having to remember where they got up to the day before. Most of us do this here and there – if you’ve ever prepared a full meal you know that you sort the elements of the meal in descending order of cooking time. This means that, for example, once you’ve put something in the oven, you don’t just stand around waiting for it to cook, you get on with preparing the rest of the meal so that it all happens in parallel and everything comes together at the same time. Productive people do the same with as many of their activities as they can, so that whilst they appear to have many things on the go and have many things come together at their proper times, at any single given moment they’re still obeying the magic number. However, that does require some thinking ahead, which also spins us back to principle #1! I can’t emphasise the importance of this principle enough. I’m sure we’ve all experienced the “Can I just have five minutes?” interruption and we all know it’s never just five minutes. I once had a colleague leave the office on the basis of a five-minute interruption and he came back over 2 hours later! The most productive and time-savvy people I’ve worked with are actually quite selfish with their time, especially when working on more tedious tasks, and are comfortable using phrases like, “I’m sorry, I’m really busy at the moment. I have 15 minutes spare at 2:30 – can you come back then?”* Some of them even schedule their ‘interruptible time’. Too often we are overly optimistic with how fast or productively we think we can work or what we can get accomplished in a set amount of time, often because we don’t account for hiccups or problems that might crop up. I’ve found this especially true of people’s estimates of meetings! Great time managers are a lot more aware of their true pace of work and much more realistic which their estimates of how long something will take, even under pressure. They take stock of their past performance and plan according to experience rather than naive hope. There you have it – seven key principles for becoming more masterful of your time. 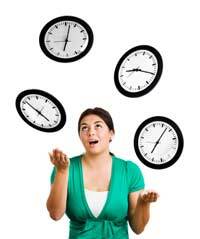 Remember though, successful time management doesn’t come from just knowing what to do – it comes from actually doing it! I’d love to hear from you if you’ve got other principles you’ve found useful too. * One knock-on effect of this ‘can you come back later’ approach is that often they don’t return, having gone away and figured it out for themselves – from some anecdotal estimates it can be as high as 2 out of 3!